In the last year, more than 90% of U.S. employees used their personal smartphones and tablets for work. They aren’t just checking their email either — mobile devices have become an indispensable part of how employees edit documents, access internal applications, collaborate with co-workers, and increasingly, watch your organization’s videos. Yet for many businesses, that last point is a big problem. Why? Because the rules of sharing and managing enterprise content like spreadsheets and slide decks don’t apply to video — especially when it comes to sharing and playing videos on phones and tablets. Videos are unlike any other file type that gets shared within the enterprise. Video files are typically massive compared to documents, spreadsheets, PowerPoint presentations, and the other forms of content you find on your internal corporate portal. A 20-slide PowerPoint deck, for example, may only take up 1-2 megabytes of disk space. Compare that to a single minute of video captured on an iPhone — which has a footprint of between 80 and 120 megabytes. Given that most corporate town hall meetings and training videos run 30-60 minutes or more, video files are often measured in gigabytes rather than megabytes. Videos are delivered within your network using a different mechanism than other types of files. While documents are simply downloaded from a file share or corporate portal and opened on your local device, videos typically need to be streamed from the server on which they reside. When videos are streamed, they’re never downloaded in their entirety to the local device — instead, they’re sent to the device bit by bit in small chunks, which are then played and discarded. This approach is particularly important for mobile devices, which may not have the hard disk capacity to download a multi-gigabyte video file. Video file formats are much more complex than images, documents, and other files. You can tell a lot about an image file, for example, based on its file extension. JPG files are known for their heroic ability to compress image data, TIF files for their high quality and versatility in commercial imaging, and GIF files for their grainy 8-bit quality and propensity to be used in internet memes. But the same doesn’t hold true for video files. An MOV file might contain low-quality web video, or it might just as easily contain ultra-high quality 3D video and five channels of theater-quality audio. This file format complexity often creates compatibility challenges between videos and your employees’ mobile devices. Although videos impose a unique set of constraints on how they can be stored and shared within the enterprise, the traditional technologies used to manage business content — Learning Management Systems (LMSs) and Content Management Systems (CMSs) — still try to treat videos no differently than any other type of file. Small file size limits on CMSs and LMSs create an issue even before the video can be uploaded and shared. Microsoft SharePoint’s default maximum file size is only 50MB — too small to hold even a 60-second video from an iPhone. And even if your SharePoint administrator maximizes your allowable file size, the absolute limit is only 2 GB — still too small for most town hall meetings, classroom training events, or conference plenary sessions. This is a problem not limited to SharePoint either — Cornerstone has a 100MB maximum per file. Docebo tops out at 128MB. And Moodle can only accommodate 200MB. Simply stated, LMS and CMS solutions just aren’t able to adequately store the file sizes required by most of today’s business videos. Additionally, even when a file can be stored there, LMS and CMS solutions typically require users to download files in their entirety rather than building in streaming capabilities. For many of your employees, this prerequisite may render those videos completely unplayable. The majority of today’s mobile devices offer only either 8GB or 16GB out of the box, and often at least a quarter of that is reserved for operating systems and other installed software. Once your employees have added their own apps, taken their own pictures and videos, and uploaded their music collection, the devices may only have a gigabyte or two — or even less — of available space. And that means downloading your latest event keynote presentation may not be possible. Finally, today’s LMS and CMS options aren’t able to convert files for playback on any device. 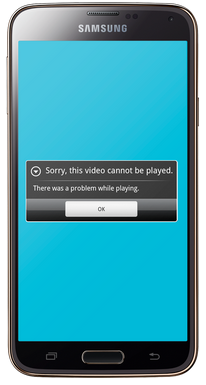 In an era where video file formats, codecs, and containers abound, it’s common to find that some types of videos simply can’t be played on other devices. Apple’s iPhone and iPad, for example, famously do not support Flash video — and that’s just the tip of the iceberg. Without attending to the problem of format conversion, many of your employees will only see a “File Type Not Supported” error message when they attempt to watch your recordings. To support the unique requirements of video, in recent years video content management systems (video CMSs) have rapidly grown in popularity as a video-ready complement to existing LMS and CMS software. They provide a secure, company-wide destination for posting, sharing and discovering mobile video content. And they take the hassle out of formatting, automatically stream your recordings for optimal playback on each device, index all the content spoken or shown in the video to make it searchable — and make sure that every employee, regardless of whether they have an iPhone, a Samsung Galaxy, or any other device, gets a great video playback experience. Panopto’s industry-leading video platform includes video recording software, live streaming software, and video content management in one tool that integrates easily with LMSs, CMSs, video conferencing systems, and more. To try it for yourself, contact our team to request a free 30-day trial today.